Sevilla online ES · Cordoba - Andalusia, Spain. Cordoba was founded in ancient Roman times as Corduba by Claudius Marcellus. It was captured in 716 by the Muslims, and Cordoba became capital during the Umayyad Caliphate, the period of its apogee, with a population ranging between 250,000 and 500,000 inhabitants. 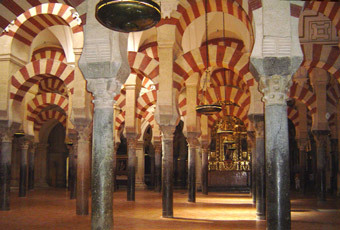 It has been estimated that Cordoba, by then, was the largest city in Western Europe and, perhaps, in the world. The old town contains many impressive architectural reminders of when Cordoba was the thriving capital of the Caliphate of Cordoba that governed almost all of the Iberian peninsula. The mosque, which contains columns that date back to the Roman and Visigothic periods, was primarily constructed during the Umayyad period (its construction started in 784), and was converted to a Cathedral after the Reconquista by the Catholic Kings in the 15th century.